You did it! Your 200-hour yoga teacher training is complete, and now a new journey begins. If you are new to teaching and are starting to find your groove, chances are you’ll have a lot on your mind in the first few months of teaching. Can I offer you three small pieces of advice? Keep your practice alive. Make a strong commitment to your own asana routine. And if you feel your practice becoming stagnant— you aren’t reaching for new poses, or you aren’t feeling inspired to find your edge — write down some of your goals. Track your progress. Hold your feet to the fire in the same way you do with your students! Take time off to recharge your batteries. This is especially helpful if you begin to teach classes at a bunch of different studios and find yourself working odd schedules, driving all over town, or feeling frazzled at the end of the day. Schedule some “you” time. Do your favorite lazy thing. Honor yourself for this incredible work you are doing, and remember to take gentle care of yourself. You gotta practice what you preach, and that means finding balance. Keep your healthy boundaries. The more you teach, the more you connect with those around you. 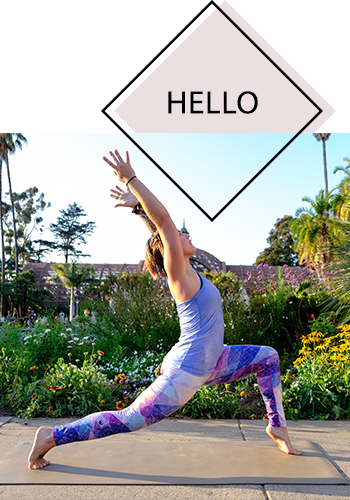 Students, fellow teachers, studio owners and staff, members of the community, friends, family, colleagues, people at the grocery store who ask you about the yoga mat you’re carrying around… you name it, people are going to start flocking toward you and your bright, shiny energy! Remember that although there is a certain thrill to sharing your passion and allowing others into your energetic bubble, there is also the possibility that they can zap your energy, take advantage of your generosity, or manipulate you in a way that’s hurtful. Keep your wits about you and notice when you’re feeling an intuitive “gut” reaction that says “no.” Be willing to honor that, and to speak on it or take action. Remember your worth, keep your own energy sacred, and charge what you deserve to be paid because you’re out there putting your heart and soul into teaching these classes! Photos by Jessica Bartlett. Yoga mat by Clever Yoga. Leggings by Real Yoga Gear.